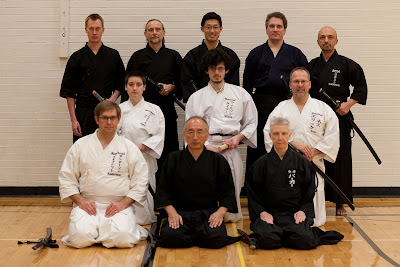 The Musoshindenryu Iaido - Aggasiz Dojo , is happy to announce our sixth annual IAIDO and JODO seminar in Fargo, North Dakota on April 13, 2018. The returning guest instructor this year will be 7dan Pam Parker sensei from the KenZen Institute in New York. We welcome Parker sensei back with us again! Because of the similarities of the sword, practitioners of the Korean styles of Kumbup or Kumdo may also find this seminar interesting and informative. The 2018 seminar will be hosted at the Agassiz Dojo in Fargo, ND. A complete schedule can be seen on the Schedule page. Photos from previous events can be seen in our photo gallery on Facebook. 2015 Details Finalized The details are (mostly) finalized, and the site has been updated. We've locked in Parker sensei for the second weekend in October, 10-11. The venue for the seminar and the Saturday evening event are set, and everything is ready to go!Please register online so we have a good idea of numbers. The early registration pricing is available until Sept 10th. 2015 Seminar Announcement The Agassiz Dojo will be having our 4th annual iaido seminar in Fargo, ND on October 10 - 11, 2015.We will be having guest sensei from the AUSKF leading the instruction in seitei iaido.This is a great training opportunity for anyone who practices iaido to not only brush up on their seitei iaido, but basic skills as well!More information to come as we learn who the guest sensei are, but reserve the date and start your registration!